Another successful mission trip was had April 4-10, 2018. The progress at St. Benoit is astounding. When we started the ministry in 2012 we counted 50 students in elementary school. What a wonderful experience to count 427 students from Pre-K to high school in class on Friday during our visit. Many of the older students came up to us individually and thanked us in English for your support and giving them the opportunity of an education. It is very heartwarming to see these students excited to attend school and succeed in their classes. The elementary classes greeted us with a welcome song, mostly in English. We spent time in each class room and Lynne and Maggie had prepared fun STEM lessons for each grade. From coloring paper airplanes, using protractors to launching rockets the students really enjoyed it. The elementary school is complete with the final plaster finishing and kitchen in operation. They use a latrine outside and need some much needed toilets, but that will come in time. The church was beautifully decorated for the children's mass on Friday and the Sunday rite of confirmation mass with Bishop Dumas. There were 58 young adults confirmed on Sunday. Monsignor Wildor is doing a wonderful job of leadership in the community. The construction hums along and all funds for projects are accounted for. The second cistern was dug and cement was being poured during our visit. The second floor dining room is in use and most all of the rooms on the second floor are complete. The solar batteries were installed and the clinic enlarged. The clinic serves about 100 patients a month. We brought a small autoclave and many medicines the nurse had requested. As a spiritual leader, Monsignor Wildor, not only creates disciples of his parishioners but leaders in the community. There were two priests; Father Gary, Father Chandler and one seminarian during our visit. Fr. Chandler surprised us during a homily in which he broke out in perfect English for us. He also speaks Italian. All of the lectors are students who are trained on how to formally address an audience. Monsignors homilies are woven with spirituality and morality. He is the moral compass of Dessource. He married eight couples in December at a group wedding ceremony, and baptisms are held once a month. The community is really coming together to support the parish. The high school has seven grades and has certified teachers paid by the hour. The facility needs water, a roof and a fence, but the kids come daily to class. All of the students eat lunch in the cafeteria at the rectory building. The lunch is a scant bean gravy and rice, but they are happy to receive it. We learned that the rice he receives from Food For The Poor is now being rationed. We found the very basic tools for school lacking such as paper, pencils, pens, geometry instruments, calculators and math tools for the elementary classes. As the school has expanded the teacher salaries continue to be the largest expense. Some live in the facility and most walk from nearby homes. It is difficult to find certified teachers to live in the rural area of Dessources. But by the grace of god, they come by foot. From our ministry we have spun off other evangelization programs. St. Dominic in Lakeview has adopted Mt. Carmel in Haiti. St. Francis of Assisi, uptown NOLA has built the St. Francois Xavier Chapel in Giles, Haiti. 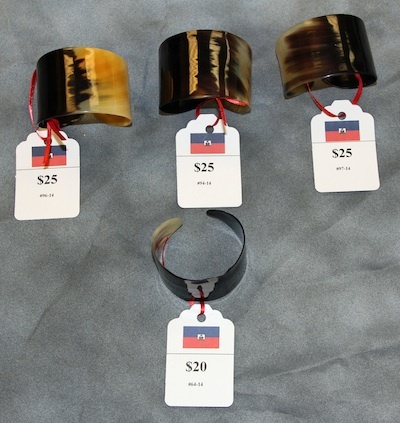 Karen & Tom Sheehy of The Healing Eyes of Mercy is sponsoring the first 6 students at the university level in Haiti. The Pastorello family and private donors have built two homes on church property for the most needy. Gregg and Letha Tepper and other parishioners have sponsored students education at St. Benoit and at the university level. Thank you for all of your support. A huge THANK YOU from the people of Dessource does not even cover the appreciation that they have for the parishioners of Mary, Queen of Peace. We really do feel like we are home when we are with them. Their warmth, grace and prayers are always with us. 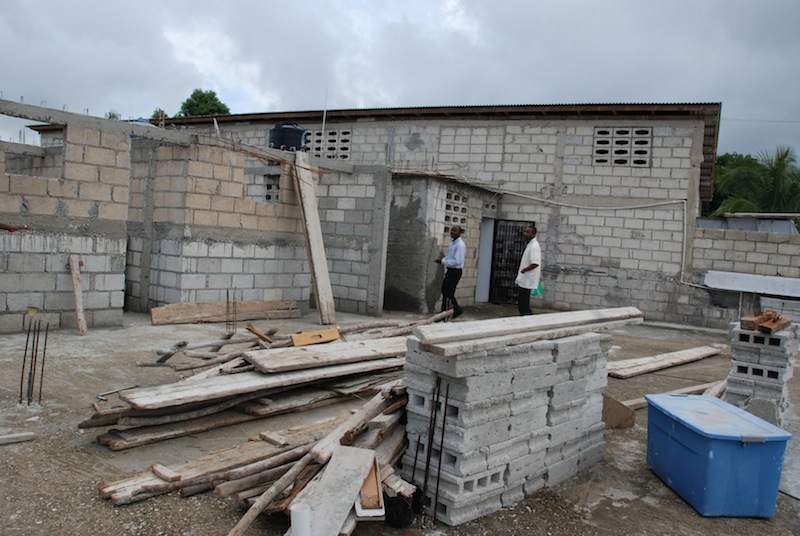 We are sharing the good news: The rebuilding of St. Francois Xavier chapel in Giles, Haiti. 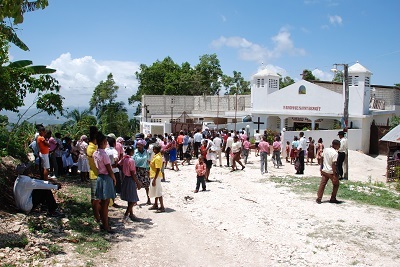 During our first visit to Haiti in 2012 we visited the hardest hit chapel of St. Francois Xavier in Giles, Haiti. It is about a 45 minute drive from Dessource and the road is quite difficult. This chapel was established in 1889 and is the oldest chapel of St. Benoit. The people greeted us warmly and we held mass under the blue tarps and sang with the choir. It sits high on a mountain top with a spectacular view to the ocean. 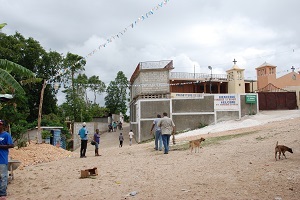 It had the highest priority of being rebuilt, but not by any Haitian supporters, even the church. During many other visits we continued to visit our friends at St Francois Xavier and shared our hope with them that someday the chapel would be rebuilt. 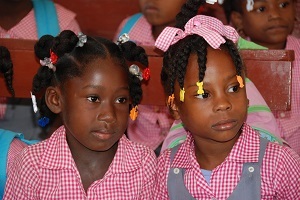 The MQP Haiti Solidarity Partnership could not assist as our focus is with the main church and school at St. Benoit. However, we were diligent in finding a sponsor for them. We found that sponsor in Fr. Mike Schneller, pastor of St. Francis of Assisi, on State Street, in uptown New Orleans. We met with Fr. Mike and brought Monsignor Wildor later in the year to continue the message. Fr. Mike put it out to the parishioners who were reluctant at first with such an unknown project. A few people expressed an interest, but they just weren't sure it was achievable. Their parish council approved the support of the project in 2016 to coincide with the 125th anniversary of St. Francis of Assisi, uptown. 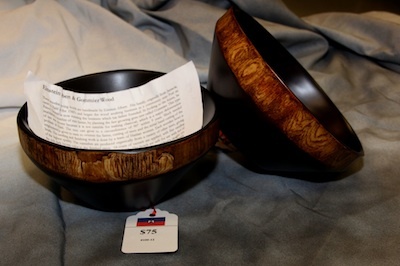 They raised over $80,000.00 to rebuild the chapel and a small rectory. Melisa Rey, of St. Francis of Assisi, joined us during our April 2017 trip and returned excited to complete the project. Monsignor Wildor was instrumental in acquiring the workers and provided oversight to complete the chapel in time for the December 2017 visit from Fr. Mike. 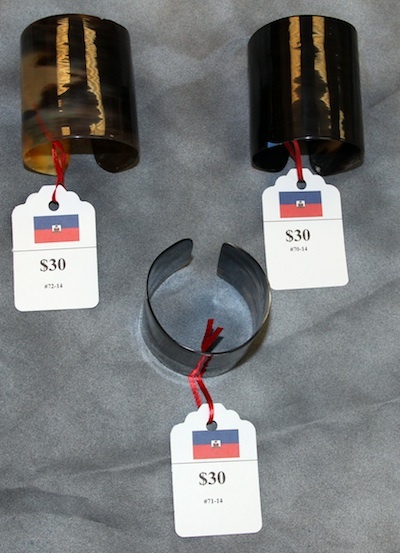 All of the funds had oversight by the Tony Pastorello and the MQP Haiti Solidarity Partnership. The dedication was complete during their December 2017 visit which coincided with the feast of St. Francis Xavier on December 4th. Bishop Dumas was in attendance and the parishioners were extremely grateful for their new chapel and their renewed hope. There are many other chapels damaged in the 2010 earthquake that still await hope. They are: St. Isadore, St. Joseph, St Peter and Paul and Our Lady of Fatima. 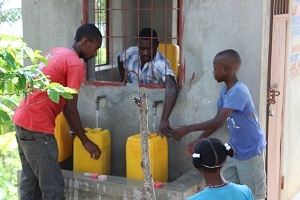 Find out more about our Haiti Partnership here. 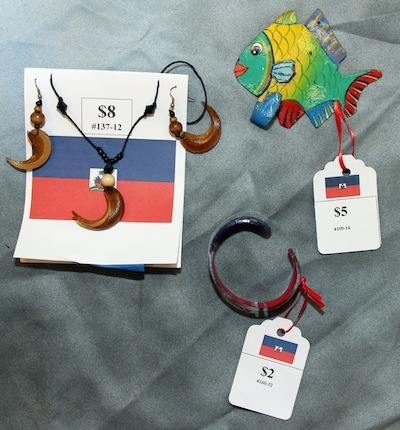 Haiti faces daunting challenges, but there are many reasons for hope. Read the story here. 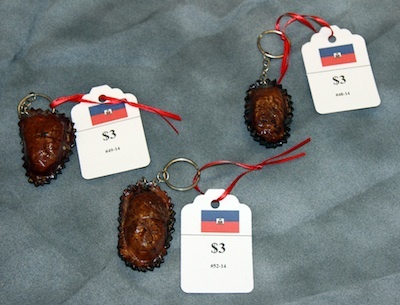 Micronutrient distribution now locally in Port au Prince thanks to Vitamin Angels. St. Benoit nurses, Martine Louis and Gierda Poulard, will attend the next symposium in Port au Prince scheduled for 14 June 2018. This is the second symposium that St. Benoit has attended. The grants continue to be distributed to St. Benoit for Vitamin A, Albendazole, Pre natal and multivitamins for children ages 6 months to 5 years. These are life saving micronutrients for the children. 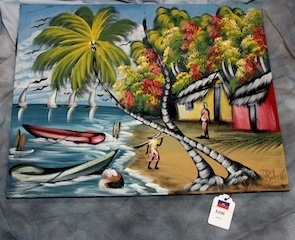 Thank you Vitamin Angels for your continued support of our mission in Haiti. $5,000.00 for tuition, which pays for some operating expenses. 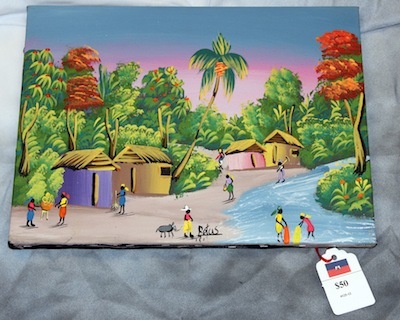 Please keep the Haiti Mission Travelers in your prayers during their trip April 8-14. They are: Fr. Ian, Sr. Marina, MuguetBolotte, Tony Pastorello & Beth Baran. 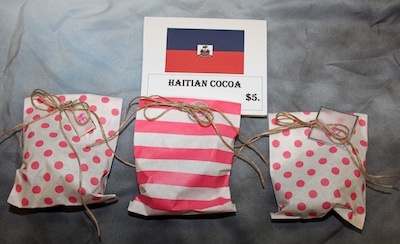 "We thank God for the generosity of the parishioners of MQP for their participation in the Night in Haiti. We will continue to pray that God bless them and their hands. A special blessing for you and your family members and all ministry members who work hard to make this event happen. On behalf all the students, all parishioners of St Benoit Dessources I say to you all a big thank you with all my heart. Also thank you to Fr John and Fr Ian. 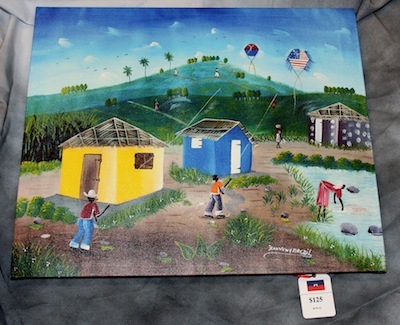 Thank you to everyone who work in any way to make the Night in Haiti a reality." Bishop Dumas, Msgr. Wildor, Fr. Ian celebrate mass with mission travelers, Beth Warwick Baran, Pat Veters, Sr. Marina, Muguet Bolotte, Tony Pastorello, Mark Ripple. 2015 Front of St. Benoit de Dessources. Rectory entry to the left with metal gate. New bell tower complete. 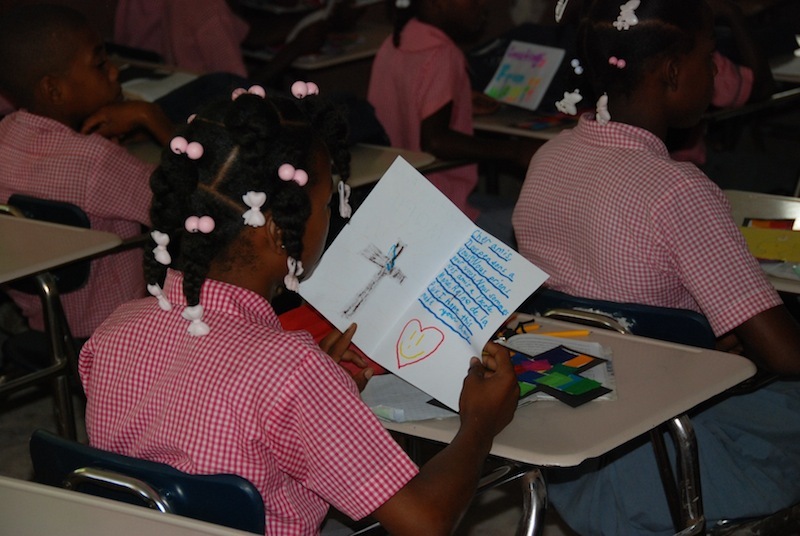 4th grade enjoying the cards written in French and sent from Mary, Queen of Peace schoolchildren. 2nd story of rectory to left, with assembly hall in the background. 2nd story of church, assembly hall. Roof of middle school to the right. 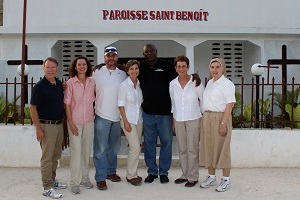 The 4th Haiti mission trip was very successful and we are pleased to report the significant progress at St. Benoit. The cafeteria is now complete with plaster, paint, wall paintings of the saints of the 6 chapels. The elementary and middle school classrooms are completely plastered, painted and furnished with desks and chairs. The school kitchen, pantry and pre-K classrooms are complete. The propane stove is in regular use and they are conserving propane by cooking the beans on the open fire and saving the rice for the stove. The school lunch continues to be well received and very needed. The rectory has added 3 rooms, one downstairs, plastered and painted and two upstairs in raw cinderblock form. These rooms will be used by the many seminarians that visit and stay at St. Benoit. During our visit there were three seminarians. The seminarians work as teachers during their time at St. Benoit as they work towards their ordinations. The 2nd story of the church is in raw cinderblock form and has a metal roof. This will become the assembly hall. Plastering of the floor, walls, electrical and painting will complete the space. The finishing work continues on the exterior the the school, a beautiful plaster seals the cinderblock and painting will be the last step. There is a nursing station off of the rectory and a full time nurse. The room is partitioned by a curtain with a bed in the rear for those that need it. We will continue to bring more medication for the children and vitamins during each trip. She is administering the albendazole, vitamins and vitamin A. The water system is working well and is connected to a septic tank 30 feet under the rectory. 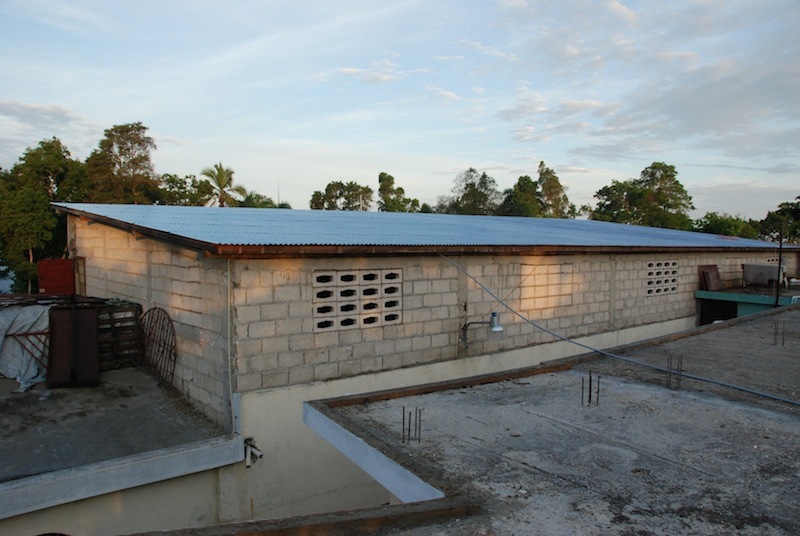 A large cistern is part of the school structure and acts as a two story wall. The cistern is drained and cleaned with bleach monthly. The people of St. Benoit continue to say "THANK YOU MARY, QUEEN OF PEACE" they are most grateful for all of the blessings they have received. Read more about the trip from Fr. Ian's May Peace Times "Hearts that beat as one"
It is hard to fathom that our sister parish of St. Benoit in Haiti, when we first began our partnership with them, lay in ruins after a magnitude-7.0 earthquake, the most severe one to strike the country in over 200 years, completely devastated the country. This single event left at least 250,000 people dead and over a million people homeless. Our parish of St. Benoit was no exception to heartache and disaster. The main campus of the parish was hit hard, crippling the church building. The chapels that belong to St. Benoit (6 in total) suffered severe damage, some having only their altar left standing. 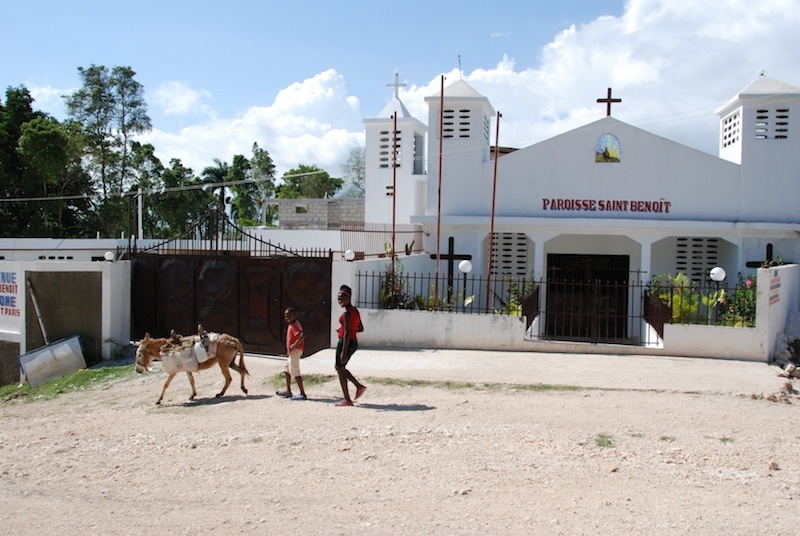 After the earthquake, St. Benoit’s parishioners swelled as refugees from the nation’s capital of Port-au-Prince sought a new life away from the ruins of the capital city. In the face of this, the parish’s new priest, Msgr. Wildor Pierre struggled to provide for his flock, but ever confident that God would provide. All of this, however, is not immediately known when one steps into the confines of the new compound that is St. Benoit Parish. 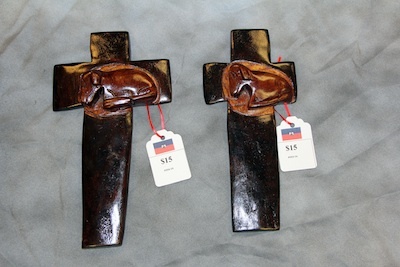 The beautiful rectory and church has tiled floor and fresh coats of paint and a style that immediately calls to mind the Franciscan mission churches of the Southwest United States. The multilevel compound houses not only Msgr. Wildor, but also three seminarians, classrooms for 450 school children, a parish meeting hall, the church, and sacristy. The parish has access to running water, a vital and precious resource, as well as solar power and a generator that is used sparingly. In a country whose capital still houses the ruins of the presidential palace, St. Benoit stands as a beacon of hope and new life. The physical parish itself only hints at the devastation wreaked upon the area just five years earlier. 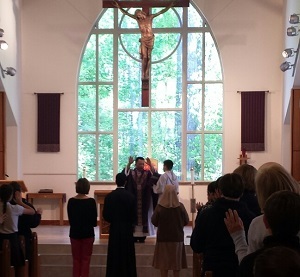 Even more important than the physical building itself is the testimony of the living church present at St. Benoit: her parishioners, children, and Msgr. Wildor himself. It would be difficult not to notice the gratitude and joy on the faces of the people of St. Benoit—a joy and gratitude that paradoxically radiates amidst the staggering poverty that surrounds them. The people of Dessources do not have much, but what they do have, they are grateful for and they acknowledge it all as a gift from God. Rarely does Msgr. Wildor have a conversation in which he does not boisterously proclaim, “Praise God! Praise God!” And just as his leadership helps the construction process at St. Benoit reach ever new heights, so does his spiritual leadership foster the life of the parish. His gratitude and joy sets the example for those in his care and is perhaps best reflected in the children of the school at St. Benoit. Eagerly they come to school and intently do they absorb their lessons. 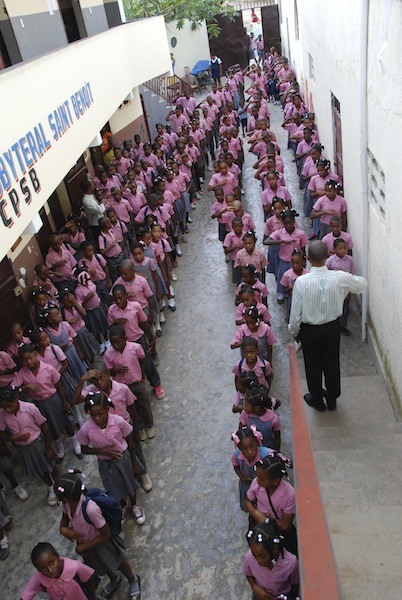 All of the children at St. Benoit pass their exams—all of them. And this is because education is more than a formality; it represents hope for them: hope that they can make a difference and change the situation that surrounds them. For the children at St. Benoit, simple pleasures still amaze them and fill them with wonder and awe. Evidence of this came from their amazement and tangible excitement when our merry group of seven helped them to make paper butterflies out of colored tissue and clothespins. Simplicity marks their life, but it is a blessed simplicity. As I come away from my first visit to St. Benoit, I come away with several important points. First, as I told Msgr. Wildor and the parishioners of St. Benoit on the eve of our departure, what we have between Mary Queen of Peace and St. Benoit is something far greater than any monetary partnership. It is an opportunity for us to engage the universal mission of the Church, recognizing that the Body of Christ as spoken of by St. Paul in 1 Corinthians 12 truly does not have boundaries—it goes beyond our local parish, state, or nation: these are our brothers and sisters. Secondly, it has been an opportunity for us to experience a growth in our own faith as we encounter Christ in these new friendships that have flowered through our 4 years of partnership. Additionally, I myself have a far deeper appreciation for the incredible generosity of our parishioners here at Mary Queen of Peace. Coming into this project, without having been a part of its origin, it was difficult for me to truly appreciate how instrumental the people of Mary Queen of Peace have been in helping Msgr. Wildor and his parish. 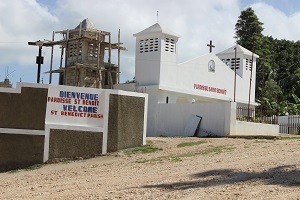 Through the support of parishioners at Mary Queen of Peace, construction on the church has been completed; construction on the school has made significant progress and continues; teachers and staff have salaries; the water well was completed in 2014 for $16,000; a goat program (another valuable lifeline for Haitians) has been established through Food for the Poor; etc. All of this enables them to work harder and harder to create their beautiful community. Truly, I am humbled by the generosity of our parishioners and I cannot fully convey in words the gratitude of the people of St. Benoit. They never ceased thanking our small delegation during our visit! I, in turn, cannot thank Msgr. Wildor enough for his great leadership and stewardship of his parish. His diligent care and charismatic leadership are invaluable aids in moving forward in our goals. As I close this small reflection, I encourage renewed support for the Haiti Solidarity Partnership here at Mary Queen of Peace as we move forward in our relationship. It was clear to me during my short time in Haiti that the hearts of the people of Dessources beat in unison with the hearts of us here at Mary Queen of Peace. Without ever meeting me, they hugged me and told me they loved me because I represented this wonderful parish that has done so much to help them in their hour of need. Give in whatever ways you can: money, donation, time, prayer, etc. As our Holy Fathers have repeatedly reminded us, it is in a life of self-gift and service to those around us that we discover who we truly are and that we encounter the face of Christ: “Jesus identifies himself with those in need, with the hungry, the thirsty, the stranger, the naked, the sick and those in prison. “As you did it to one of the least of these my brethren, you did it to me” (Mt 25:40). Love of God and love of neighbor have become one: in the least of the brethren we find Jesus himself, and in Jesus we find God” (Benedict XVI, Deus Caritas Est [God is Love], 15). More pictures to come...slideshow date TBD. Five years have passed since Haiti suffered one of the most devastating earthquakes ever to hit the Western Hemisphere. 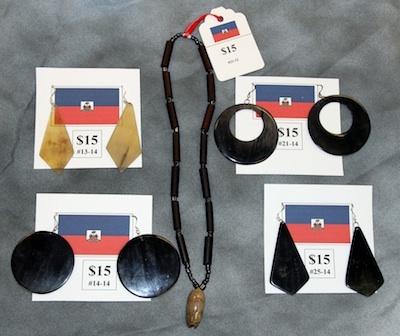 On January 12, 2010 a catastrophic 7.0 earthquake decimated the Haitian capital of Port-au-Prince. It is estimated that over 300,000 people were killed and 1.5 million were left homeless. By December of 2010, more than 8,500 more lives had been claimed by a cholera outbreak. UNICEF estimates that 430,000 children were either orphaned or abandoned. 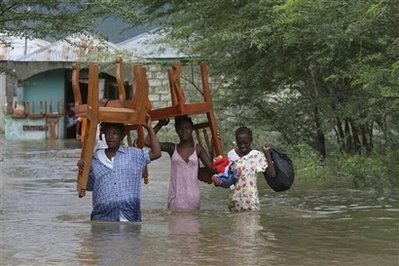 Today, due to Haitians working with numerous international partnerships, the country is continuing to recover. In Port-au-Prince, there is new housing, an enhanced police presence, improved roads and better access to health care. Mary, Queen of Peace Catholic Church is proud to be a small part of this recovery. 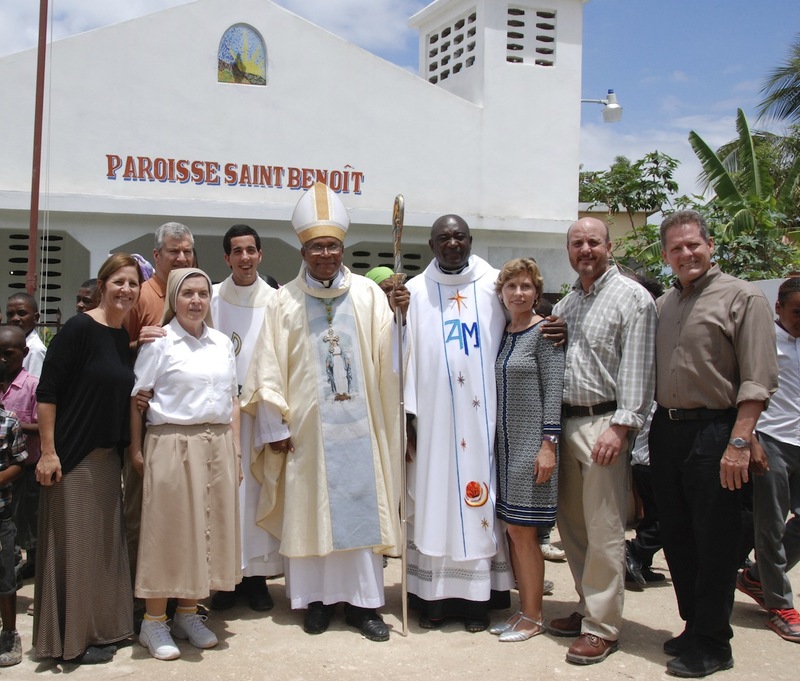 Our Haiti Solidarity Partnership with St. Benoit Parish in Dessources has made many strides since 2010. We have helped rebuild their church, helped build a new elementary school (including a school cafeteria) and helped drill a water well for the community. We received a grant to provide multivitamins to expectant mothers and young children, and we have sent funds for school lunches, teacher salaries and scholarships for elementary and middle school students. We have accomplished great things and yet there is so much more to be done! We hope to continue our partnership with St. Benoit and help to improve the lives of the approximately 5,000 families of the parish. Our committee would also like to extend a huge thank you to the parishioners of Mary, Queen of Peace Catholic Church for giving the people of St. Benoit hope when they were in despair. My favorite time of day at St. Benoit is early morning. I wake to the sounds of doves cooing in the courtyard outside the rectory and roosters crowing. I hear villagers calling to each other as they pass on the road, on their way to the fields where they eke out a living harvesting corn and beans. I get dressed by the light that filters in through the high open windows of the bedroom. We have electricity only when the generator is on or the solar panels give us power. We are 60 miles and 5 1/2 hours up the mountain from Port-au-Prince in southwest Haiti, and it feels like we are in another world. I walk up the stairs to what is now the roof of the rectory but will one day be the floor of a second story. From this vantage point, the scenery is spectacular. Crop- and tree-covered hills spill down the mountainside in all directions, and there are gravestones planted among the beans and corn. Scattered paths lead to the tiny huts the villagers call home. One morning when I am on the roof, I see Monsignor Wildor Pierre, the pastor, by himself across the way. He has lifted his hands above his head, and I can tell that he is praying. Up here, so close to the sky, you feel like you can talk directly to God. Six of us from the Mandeville church’s Haiti Partnership Ministry have come to spend nearly a week in St. Benoit, our sister parish. It is the third visit for ministry leaders Muguet Bolotte and Teresan Sister Marina Aranzabal. For Clay Drewes, Tony Pastorello, Nancy Waguespack and me, it is our first, and we marvel at the sights and sounds. Tony and Clay can’t seem to stop shooting videos and taking pictures. 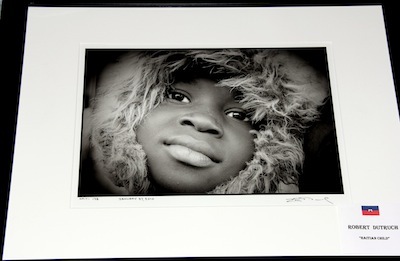 The children have such big smiles and beautiful faces, and they are always singing. They love school, and the day we give 200 elementary-school students new backpacks — a gift from Mary Queen of Peace parishioners — they are beaming. They hug them to their chests and rewrap them in the plastic bags they came in. When they leave school, they wear them proudly as they march out the door. This year, Monsignor Wildor has added middle school in the afternoon. When the elementary schoolchildren head home, 50 seventh-, eighth- and ninth-graders file into the classrooms. He has hired new teachers who teach them French and English, math and geography. 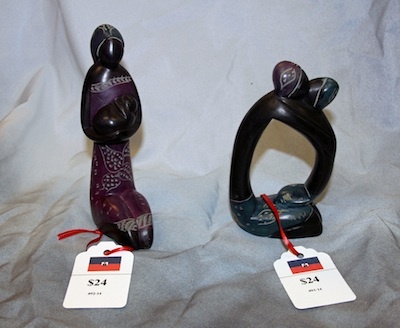 The native language here is Haitian Creole, a mixture of French and West African languages. 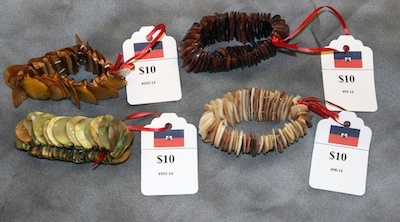 French is the language of the educated classes in Haiti. Monsignor Wildor’s plan is to add 10th, 11th and 12th grades for the next school year. When a member of the mission team suggests it might be better to add just 10th and build from there, he listens closely, but something in his eyes tells me he is determined to add all three grades. This year, students in the village of Dessources must walk two hours to get to the closest high school or else stop going. His dreams seem lofty in this poverty-stricken country, but when we see all that he has done since the local bishop sent him to St. Benoit in 2009, we realize he not only has dreams, he finds a way to carry them out. I ask him if that made him lose heart, and his answer surprises me. “It is OK when I lose everything because I see people with nothing living in the street, and it helps me understand how they feel,” he says. He prayed to God to help him and bring others to help him. The ministry at Mary Queen of Peace was the answer to his prayer. 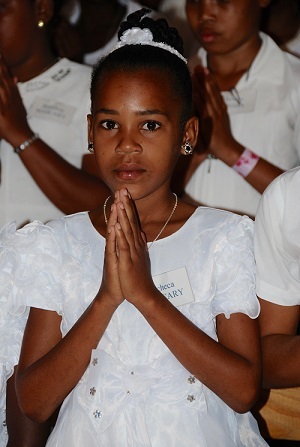 After the earthquake, Archbishop Gregory M. Aymond invited parishes in the Archdiocese of New Orleans to partner with a parish in Haiti. Through Catholic Relief Services, Mary Queen of Peace was put in touch with Monsignor Wildor. Working together, the two parishes have done wonders. St. Benoit now has a pretty little church with a roof that doesn’t leak, and a school that educates more than 300 children. A lunch program feeds them, and the Mary Queen of Peace ministry raised the money for a water well, so the villagers can fill their 5-gallon containers at a distribution area just down the hill from the church instead of walking an hour down the mountain. Ministry funds help pay teacher salaries and provide scholarships for the most promising students to attend middle school. In a country where the government provides no schools in rural areas and half the children don’t go to school, an education means everything. Our days in the village are jam-packed. There is a play day for the children complete with a wild group dance led by Monsignor Wildor, a scholastic contest, races, and musical chairs. And there are three-hour Masses filled with music, singing and dancing. The people welcome us warmly and seem filled with joy and hope. 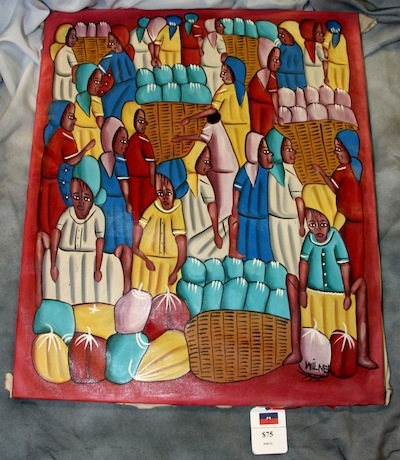 During the Offertory of the Mass, women bring up huge baskets of bananas they carry on their heads. There are bowls of oranges, cherries, mangos and mirlitons. There is corn, cabbage, a sprouting coconut, a little hen. By the end of the collection, the altar is heaped with gifts the rectory staff will turn into meals for us. We visit the children in their classrooms and have lunch with their teachers. 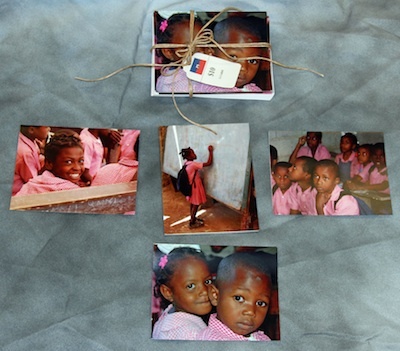 Nancy, who teaches religion to sixth- and seventh-graders at Mary Queen of Peace School, has brought flashcards, books about Haiti, and laminated maps for the school. When the teachers see maps of Haiti written in French, their eyes light up, and they say “Ahhh” in unison. They can’t wait to share them with their students. We also visit Mount Carmel, a parish that has no sister parish in New Orleans. The pastor tells us he had to close the high school because he couldn’t pay the teachers, and the elementary teachers often work without getting paid. It is much like St. Benoit was the first year mission members visited, and Sister Marina wants desperately to find a parish in the New Orleans area willing to form a partnership with Mount Carmel. “There is so much need here,” she says. 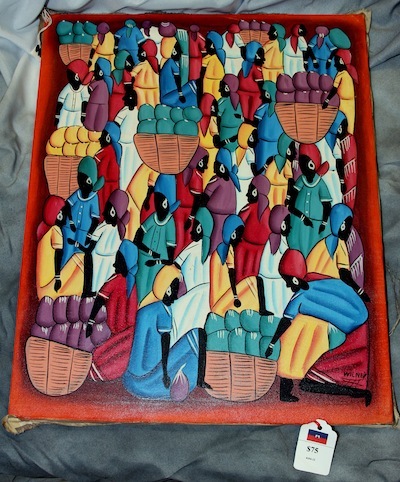 On Saturday, we go to the market where the villagers of Dessources gather to buy, sell and exchange fruits and vegetables, bread and beans, goats, chickens and pigs. On a hillside just before we reach the makeshift booths is a parking lot for the dozens of donkeys who serve as local taxis and pickups. The market is a wild place, with people shouting, music playing, goats bleating and young men cruising along the unpaved street on motorcycles they use to transport people up and down the mountain. The sun beats down, and the smell of gasoline mingles with the smells of charcoal and food cooking. Sunday, after Mass, with help from some of the village women, we hand out vitamins to young mothers and give worm medicine to children ages 1 to 5. Sister Marina and Muguet, both fluent in French, explain that the medicine will help the children stay healthy and that they should take only one vitamin pill each day. I, not being fluent in French, admire babies and hand out blankets and dresses sewn by women in St. Tammany Parish. Later, we meet with Boy Scouts and Girl Scouts to give them the first-aid kits assembled by Max Tepper, a young parishioner at Mary Queen of Peace who is working on becoming an Eagle Scout. Muguet and Sister Marina explain what each item is before handing them out. Chances are the children have never seen a Band-Aid. Throughout the days, I keep noticing one young woman who is a leader. I hear her singing and playing the bongo drum in church and also in the church courtyard where the children gather to play. I see her making signs that say, “Welcome Mary Queen of Peace,” and watch her lift up little children in her arms. I learn that Nerlyne Charlotin is 19 and in the eighth grade. She is first in her class, and the students at St. Scholastic Academy in Covington are paying her middle-school tuition. When Sister Marina and I sit down to talk to her, Nerlyne tells us she loves school and she likes learning French and English. She sings for us — “Love Doesn’t Think Twice,” a Celine Dion song. When I ask how she learned it, she says her English teacher wrote the words on the blackboard and then the students listened to the music on his cell phone. She tells us she wants to finish high school and go to college in Port-au-Prince. She has an aunt there she can live with. She wants to be a nurse and come home to Dessources to help the people. Now, the nearest hospital is a bumpy 2 1/2 hour drive down the mountain on an unpaved road, and one of Monsignor Wildor’s dreams is to build a medical clinic in Dessources. It will be eight years before Nerlyne can finish nursing school. I think that gives him time to build a clinic. On our last night, Monsignor Wildor throws a party for us and his 32 staff members. There is a dinner and music, laughing and dancing. At one point Mertyl Fritznel, the young seminarian who is principal of the middle school, stands up and thanks us one more time. “This is one of the best miracles in Haiti,” he says. We feel blessed to be a part of it. Here are some pictures from our visit to St. Benoit in Haiti. More to come! 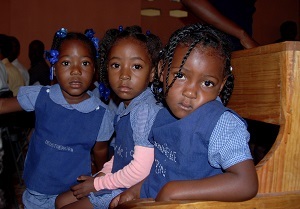 MQP Haiti Mission Trip 2014 from Karen Baker on Vimeo. As another anniversary of Hurricane Katrina approaches, I keep thinking about Fritznel Mertyl and all that he went through in 2010. It was not a hurricane that changed his life but the earthquake in Haiti, and his story stays with me. It's easy to distance ourselves from faraway disasters, and difficult to understand the scope of them. Remember how we felt, trying to explain the miles and miles of devastation after the storm? The lost homes, neighborhoods and friends, the lost fabric of our everyday lives? It wasn't until I rode through Port-au-Prince in late April and saw the piles of rubble still stacked on street corners that I began to grasp what the earthquake had done more than four years earlier. It struck a little before 5 pm. on Jan. 12. It killed well over 100,000 people and left hundreds of thousands homeless. "This was the epicenter," Muguet Bolotte said, a few minutes after we left the capital. It didn't look any different to me than what we had been seeing in the city. We were headed to Dessources, a small village 60 miles and 5 1/2 hours away on the side of a mountain in southwest Haiti. We would spend nearly a week there, handing out medicine and books, first aid kits and school supplies, prayer cards made by school children and dresses sewn by loving hands. Muguet was the leader of our mission team from Mary Queen of Peace Church in Mandeville, It was the third visit to St. Benoit Parish for her and Teresean Sister Marina Aranzabel; the first for me and three other team members. 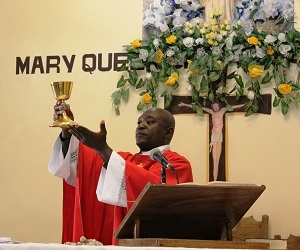 After the earthquake, Archbishop Gregory M. Aymond invited parishes in the Archdiocese of New Orleans to partner with parishes in Haiti. Through Catholic Relief Services, Mary Queen of Peace was put in touch with Monsignor Wildor Pierre, the pastor of St. Benoit. In 2012, when I first heard about the partnership, Muguet explained it this way: "It was kind of like a blind date, but we got the right priest," she said. "Monsignor Wildor is passionate about helping his people." I met Monsignor Wildor during his yearly visits to Mary Queen of Peace -- a tall charismatic man whose smile could light up the room. He had been sent to St. Benoit in 2009 when nothing was there except a tiny chapel with a leaky tin roof. There was no rectory, no school for the children. "I will sleep in the sacristy of the church," he said. When the earthquake struck, it tore off the new roof and destroyed everything he and the villagers had done in the brief time he had been there. During our visit, I asked if that had disheartened him, and he said no. "It is OK when I lose everything, because I see people with nothing living in the street, and it helps me understand how they feel." He prayed to God to help him and bring others to help him. The ministry at Mary Queen of Peace answered his prayers. Working together, the two parishes have made remarkable progress. Now, St. Benoit has a pretty little church with a roof that doesn't leak. And, thanks to funds raised by Mary Queen of Peace, there's a water well with a distribution area near the church, so the people can fill their 5-gallon containers in the village instead of walking an hour down the mountain. And St. Benoit has a school that is educating more than 300 children. In a country where the government provides no schools in rural areas and half the children don't go to school, an education means everything. "Sans l'education on ira nul part," was written on the chalkboard in the kindergarten classroom, which means, "Without an education, you aren't going anywhere." elementary school children head home, 50 seventh-, eighth- and ninth-graders file into the classrooms. And that is why Fritznel Mertyl, the man I keep thinking of, is at St. Benoit. The young seminarian was sent there to be principal of the middle school, where the students are learning French and English, math and geography. He shares his office with the elementary school principal. The day of the earthquake he was at the Center of Religious Formation in Port-au-Prince, attending a conference about the pastoral care of children, a subject dear to his heart. "It was a big gathering, about 250 seminarians and other religious," he said. "The seminarians were really happy. It had been a great conference." They had just finished the final session, and people were beginning to leave. "Some stayed behind, talking," Fritznel said. "Others were getting in cars." Many of his friends were still in the building. They told him, "Stay with us," but he and two other seminarians stepped outside. "Three minutes later, the whole two-story building went flat," he said. "I lost 14 of my fellow seminarians." He was 22 at the time. He and his two fellow students grabbed each other's hands and tried to cross the street. His friends asked, "What is happening? What's going on?" "I told them, 'It's an earthquake,'" he said. "I had seen a program on my laptop. That's how I knew what it was." One friend said, "We're dead," and Fritznel said, "No, God is not going to allow that to happen." "We were still holding hands," he said. "It was like we were dancing. The whole street corner was moving." They could see houses crumbling and falling down in pieces. "We could hear people in the rubble. They cried, 'Come and save us,'" he said. "The most difficult thing was that we could not do anything because fallen electric wires were everywhere." They were 1.25 miles from the seminary, and they started to walk in that direction. "We could see dead people everywhere," he said. "The Ministry of Education building was flat. It looked like a lasagne. Everybody in there was already dead." And then everything was white, and they could barely see anything in front of them or behind them. "We were wrapped in a cloud of dust," he said. When they finally made it back to the seminary, they saw that it was still standing. Then Fritznel headed for a nearby school run by a nun, the place where he did his pastoral care. "I would go teach catechism at the school," he said. "I knew the children. They loved me a lot." He couldn't find the nun, and he spent that night going back and forth between the school and an orphanage she ran, trying to console the children in both places. "They were crying. Every five minutes there was another tremor, and they were very, very afraid," he said. He tried to find people to help him get the students who were trapped under debris at the school. "I wanted to cry, but I knew I could not fall apart in front of the children," he said. "I was afraid if I stopped talking to them, they would die. I wanted to give them hope, hope that they would stay alive." Eventually, he learned that 224 students had died at the school where the children loved him. "It was 224 children," he said softly, as if he still could not believe the number. Eight days after the earthquake, his mother, who lives in the central part of Haiti, managed to reach him on his cellphone. "When she heard my voice, she started to cry," Fritznel said. "She said, 'Today, I was reborn. Today, I begin to live again.'" For two months, he stayed with the orphans, and then he was sent to a parish. Six months later, he was back at the seminary. Then, last October, he was sent to St. Benoit to work with Monsignor Wildor. Besides being middle school principal, he teaches catechism and is in charge of the choir and all the music. He is supposed to be there for a year, but that could change. And he has no idea how long it will take him to become a priest and have his own parish in Haiti. "Nothing is really definite," he said, smiling. "This is the country of 'I-don't-know.'" But he is happy living in Dessources, where the climate and the children are pleasant and the villagers are generous and hospitable. "I love the people here, and they love and respect me," he said. The best part is helping Monsignor Wildor, who works so hard and has accomplished so much in four years. "It is really good for me to see someone with so much courage," he said. "I feel encouraged to become a good priest with the heart of Christ because I see that in Monsignor Wildor. He is very good at forgiveness." What impressed me so much about Fritznel is how he has responded to the great losses in his life. He still grieves for all the suffering caused by the earthquake, and for the children and the friends who died. But sometimes he feels their presence, and he knows he must keep going, for them and for the people who need him. "I used to be a man who could be easily discouraged," he said. "But I realize now, even in the most difficult times, I can accompany people who are hurting. I can give them hope." 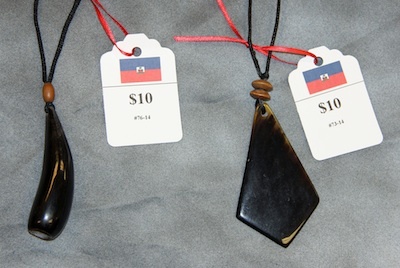 A recent article in the AARP magazine details how that organization has provided help to Haiti. Click here for the story.